You have been saving up for quite a while to finish building your backyard paradise. The furniture has been delivered, your deck is beautifully stained, and your river stone walkway is finally done as it weaves through your grass to that… empty round sitting area. It is time to fill the center with your dream fire pit! Warming Trends offers the best products in the industry to make sure your new fire pit is as perfect as can be. What exactly comprises a fire pit? The most obvious pieces of a good gas fire pit are the enclosure and the fill media, but that is simply what the eye can see! The enclosure is actually what holds the burner and media, not the stone piece in which the enclosure sits. The media is the pieces of material that fill the enclosure such as glass pieces or stones. The burner is the device itself that sits in the enclosure, producing the actual flame. The burner sits on top of a plate and is connected to a gas line that comes out of the fire pit and connects to a gas line from the house. Choosing to build your gas fire pit using a Warming Trends burner is a choice that will keep giving back to you. There is a reason that they are known as the best fire pit manufacturer in the industry! Their technology is a sure way to make sure your fire pit is built to work efficiently and powerfully well into the future. That is why Montana Fire Pits has chosen to partner with them as an authorized dealer. 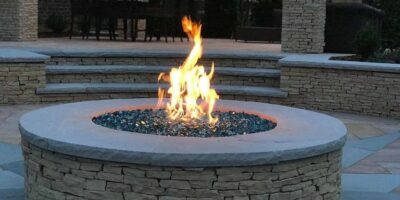 Building a fire pit can be a tricky endeavor, make sure to work with a knowledgeable company that uses premium products! Montana Fire Pits offers Warming Trends ready to finish fire pit kits so you can focus on creating that perfect look. All of the kits we offer come assembled and ready to install into your custom fire pit area. The kit parts include an aluminum enclosure, Crossfire burner, plate/pan, and ready to connect gas line. Don’t concern yourself with building a fire pit from scratch! Order a Warming Trends Ready To Finish Fire Pit kit from us and put all of your mental energy into building your dream fire pit area. 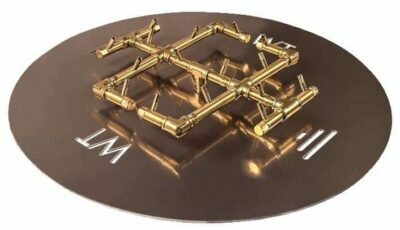 Crossfire Burners are comprised of a number of smaller parts build with perfection to deliver a perfect fire pit flame. At the bottom of the burner is the pipe opening, which connects to the gas line for delivery. The burners are then made with a series of brass pipes and connections that ensure perfect air to gas ratios before exiting of cross-hatched brass nozzles that blend the gas into the combustion point where it ignites into a beautiful flame! 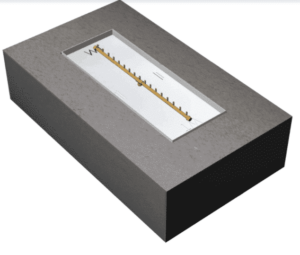 The Warming Trends Crossfire Fire Pit Burner System offers twice the flame with half the gas usage. Furthermore, the 100% brass materials mean that they will not corrode or need replacement. If you want to make sure your fire pit is built to last a lifetime, look no further than building with a Warming Trends Brass Burner System from Montana Fire Pits!